Three people walk into a store to buy quail bedding and leave with a pet rabbit. Not a joke though, because it’s exactly what happened to us in July when a certain little bunny leapt out of his pen and straight into our hearts. Strange, despite the vast array of pets we’ve owned over the years, we’ve never had rabbits. So why that day and why this particular bunny? Nobody could have been more surprised than I. We always stop to ooh and ahh at the cute bunnies; and the degus; and the hamsters and rats; and all the pets up for adoption. But it stops there. Until we saw Bunnykins. Or rather, until he saw us. He was alone, separated from the group of other bunnies in the pen next to him. Not knowing much at all about pet bunnies, but guessing he was young (he was, ten weeks young), we wondered out loud why he wasn’t with the others. What choice do you have when a bunny does that? Not knowing much anything about pet bunny ownership, we had a lot of questions to ask and discovered he was alone because he was the last of his litter. Nobody wanted him as he ‘wasn’t as pretty as his siblings’ who were fluffy and spotty and all that cutesy stuff. We couldn’t believe it. To us, he is the most beautiful bunny in the world. But because he was about to go up for adoption, we got all his vaccinations, health checks, microchipping and yes, even his neutering done for free, which was an added bonus we hadn’t expected. (We still would have taken him as we had already fallen in love, and yes, when I say ‘we’, that includes Hubby…). Now six months old, Bunnykins is as adored as ever. He is naughty (already chewed through a wire or two), grumpy at times (he did just get neutered so who can blame him? ), and impossible to catch when we let him loose in the living room. But I get payback stroking his warm, silky fur as he snuggles up next to me of an evening, and my heart melts. Bunny brings us great joy, not to mention laughter. While in France in September and struggling with my limited French in trying to explain to the hosts of our Gite that we had a pet rabbit, I realised that I told them we had a pet bread instead. (Got my ‘le pain’ and ‘lapin’ mixed up. C’est la vie…). All in all, you could say we are Happy Bunnies. Serendipity definitely played its part the day we met Bunnykins, for both human and animal. It’s played its part many times throughout my life, not least of all through blogging. I think of my lovely blogging friend Patsy Parker who surprised me early last year by painting a copy of one of my photographs and naming it ‘Sherri’s Ocean‘ (I had never had anything painted for me, much less named for me before, it was a beautiful gesture). Recently, she surprised me again by sending this delightful drawing of Bunnykins from a photo she’d seen on my Facebook page. I love it! Nate Bunnykins drawn by Patsy Parker for me. Thank you so much dear Patsy! It seems that serendipity had one last say for this post, and I needed to wait because this morning, I happened to read a little blurb about C S Lewis and J R R Tolkien and how they used to meet regularly at a well-known pub in Oxford with their writer friends, encouraging and inspiring one another. And of course, out of those meetings, those two incredible authors eventually gave us The Chronicles of Narnia and The Lord of the Rings. Life was relatively calm for me and my family that spring day in 2008, as it had been for some years after a sustained time of turmoil. Sitting in that pub, with its tiny, dark rooms, the wood paneling permeated with the smell of smouldering firewood, I let my imagination run wild at the thought of Tolkein and Lewis sitting in that very same place decades earlier, smoking their pipes, drinking ale, chatting about their latest endeavours. I listened to their whispers in the shadows of stories yet to be written, and wondered when that time would come for me, as I harboured long-held hopes of writing the book burning deep within my heart. But that day, it all seemed like a distant dream. 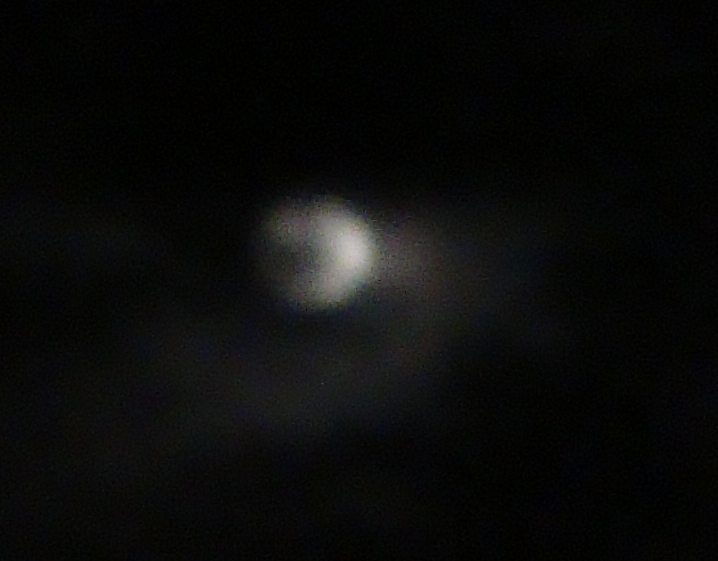 But one day was a few years off, and when it arrived, it did so unexpectedly. More troubles awaited, but the day I walked out my job for the last time having been laid off, I had no way of knowing that actually, my boss had given me the best gift of all: my passport out of my rabbit pen, setting me free to chase my dream. Wheels were already spinning, taking me to the place where I was meant to be. Because of all that happened in the years to follow, writing my book is no longer a dream, but a reality. And I needed to be reminded of all this, as I asked myself how a post about a bunny, dreams and an old English pub made sense. We cannot possibly know what life may yet spring upon us, but along the way, we can cherish and be grateful for those moments of sweet serendipty. 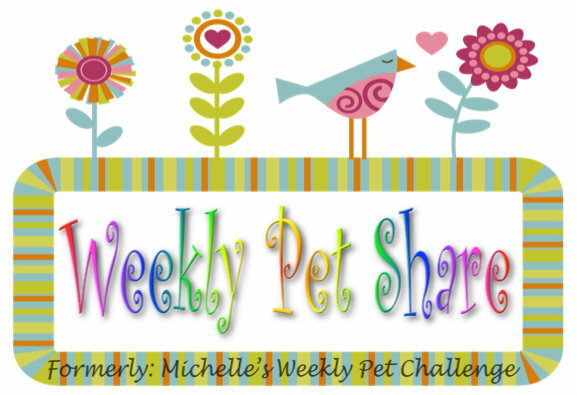 This post also is linked to Michelle’s Weekly Pet Share. Click on the link for more photos of beautiful creatures great and small! This entry was posted in Flash Fiction, Pets, Weekly Pet Challenge, Writing and tagged 99 Word Flash Fiction, Blogging Community, C S Lewis, cats, J R R Tolkien, Pet Rabbits, Pets, Serendipity, Weekly Pet Share, writing, Writing Community. Bookmark the permalink. Gosh, that Patsy, she's amazing and so talented! I have the hummingbird she drew for me, on display in my new writing room. She's a sweetheart. Awww….thank you, Jill! 🙂 I appreciate that so much. Ha…no rabbit pie, I couldn't do that! I told Natekins to put his paws (or is it feet?) over his ears when I wrote this!!!! Love the flash (though I was thinking, “She’s not going to go there…no…it’s not a bunny”) but, alas, it was. You crack me up, lady. And OH the cuteness of your dear, sweet furchildren! All of them. ❤ And, really, what choice did you have? None. You just didn't. Cute! I knew that those two authors (whatever their names…) hung out together chatting about their writing but you actually went to the pub they met in?! Envious! Great post, Sherri. *Bows head*…. Yes Sarah, I did…shameful isn’t it? But…you knew I wasn’t going to let Ethel get her rabbit, surely!! 😀 Haha…glad I made you laugh, I’m having a blast with these two as I told Charli, not sure what’s come over me…or them! Love it… ‘furchildren’ 😀 I don’t have grandchildren (yet….ha!) but I tell everyone I have grandkittens as both boys have or have had cats 🙂 Furgrandchildren! Sherri, I’m so glad you’re back to blogging! Nate is cute. Bunny fur is so soft. Glad to hear from Ethel and Fred! Is your book about that horrible neighbor? Not about the neighbor?? Well, maybe next time. I really think you need to exorcise that demon, by writing him away. But, that’s just my opinion. What’s important is what you feel to write about. I’ll go check it out, thanks. One of these days Melinda, one of these days…and thanks for reading the link! Your little Nate Bunnykins is so cute, and it looks like he knew you were going to be the right people to look after him. That picture of him drawn by your friend Patsy is brilliant. What a lovely story Sherri – I believe our animals always choose us. We see it when we are paying attention 🙂 The photo of Maisie and Bunnykins made me smile – Orlando has the same half pained cuddling relationship with Siddy from time to time……… The drawing is lovely, that is a kind, generous and thoughtful friend!! And of course Fred and Ethel keep me smiling too. Haha…yes, I can well imagine Orlando’s look, cats are so good at that ‘half-pained’ look aren’t they? Haha…I’m having a blast with these two, so glad you are too! I honestly don’t know where it all comes from, but like you, I can see them so clearly that now I actually can’t get rid of them, which I hope is a good thing… ! I love your story, Sherri! Thanks so much for posting the drawing of Nate Bunnykins! I enjoyed doing that so much! I’m happy you love it. I appreciate your friendship as well as your support of my art. Love you bunches! Have a great day. Having had numerous bunnies in my childhood, and lived with one named Leroy whom a suitor of my sister’s had brought over one Easter, and who with our pup Princess roamed loose in the house, I enjoyed your post. It must be true that its not always people who choose pets, but pets who choose their people. 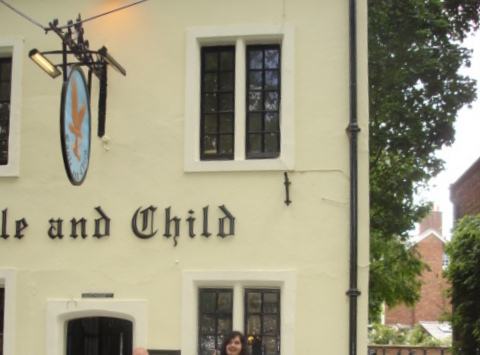 I enjoyed even more your reflections on Tolkien and Lewis and The Eagle and Child. I lived for two years across from The Flask in Highgate, and still miss the wonderful dark paneling and blackened tables and sense of history, not to mention slurping my pints of ale out of traditional glasses. As for your flash, thank goodness for the Freds of the world…that Edna sounds quite intimidating. Just love that bit about “Git in yer moron!” She doesn’t mince words 🙂 Well done Sherri! Ahh…so you are definitely a seasoned bunny owner then Jeanne! My brother and I had one pair of rabbits as children, but I don’t remember them doing much and Mum saying she didn’t like the idea of them being kept outside in a hutch. We never had them again, but then she was busy breeding and raising Siamese cats, so they took all our attention at the time. I am way overdue for a visit to your blessed isle 🙂 Can’t think of anything more appealing that meeting up with you at an old boozer! And oh dear, I’ve got lots of bunny stories from childhood. My favorites involve a black and white dynamo named Sprite and a big, fat lop-eared one named Thumper. My sisters and I spent hours looking for them in the nearby citrus orchards (before they cut them all down for new housing developments) when the bunnies dug holes under the fence in the backyard and escaped. But I am intrigued by your mother’s Siamese cats! What a unique endeavor. My hub can’t stand the idea of an animal in the house but when I fantasize about having a cat again, I always picture a Siamese or a chocolate Burmese. Ahh…. What a heartwarming story about Bunnykins. Rabbits are actually smart and make good house pets and are trainable. I found this out about 20 odd years ago while visiting a couple with a friend who knew them. You’ve got that right Tess, we had no idea how smart rabbits are! Bunnykins is litter trained (the pet store did that) which is great and we are letting him be a house rabbit and trying to train him so he knows where he can and can’t go. But there are too many hidey-holes for him to disappear beneath at the moment, so we need to get creative! I knew a family who had a Bunnykins as a house rabbit and I was blown away. Back in the early 70s dad had this good life idea involving growing more produce and keeping rabbitts for meat. My little cousins used to visit and play with said rabbits. ‘Don’t name them,’ said dad (my brother and I were at a meah teenage boy stage) but they did. Dad couldn’t actually do the deed. That fell to mum. Next visit. ‘Where’s Fiver and Hyacynth Lay?’ Cue shuffling feet and no eye contact and floods of tears. My cousin Louise has never recovered. Just as well in your flash there was a happy ending. Too much bunny trauma in my life already. Adorable pictures of your pet and a heartwarming story. Speaking of pets, they do bring so much of joy and warmth in our lives. They become a part of us, don’t they? And that part of us dies when they pass away. Thank you so much Shakti! You are so right about pets, they bring us so much joy and then break our hearts…and what would we do without them? I’m slowly coming to have a soft spot for Fred, Sherri. Maybe a rabbit hutch somewhere? 🙂 I love the look of ‘almost tolerance’ on your cat’s face. I have a friend with a Peter Rabbit who colonises the back of her settee. An expensive friend 😦 Glad life’s being kind to you right now. You’ve sure worked hard for it. Thanks so much for stopping by Sherri. Everything works out ok in the end. I’ll keep working on the vision too. I’ve had a lot of animals follow me home. It’s a gift. 🙂 I love your stories so keep them coming. You fiction is fantastic; showing your talent as always. Combine your wonderful storytelling and your friend’s art, and there’s a wonderful Maisy and Nate Bunneykins book just waiting for a chance to blossom, Sherri! This is a terrific tale–tails?–that will capture the imaginations of adults as well as children! Brava, Sherri!!! What a post, Sherri. So much to think about: bunnies, dreams and serendipity with an Edna and Fred tidbit to top it all off! Lucky little bunny – wouldn’t have happened to yours. Nate Bunnykins is so adorable. I can’t believe he was the last to be adopted. I love the story of him choosing you. But then, who wouldn’t? Thank you for introducing me to degus. I hadn’t heard of them before. How wonderful that you can now look back and see that being made redundant was the best thing that happened, allowing you to work on your book, which is nearly ready to take out of the oven and serve up to your eagerly awaiting audience. I’m definitely looking forward to my piece! Oh Norah, what a fantastic comment! I loved reading about all the places you’ve visited once frequented by famous folk…I had to laugh about the ‘not been cleaned since’ bit 😀 I’m so glad to introduce you to degus (and the friendship between Lewis and Tolkien, both of whom attended Oxford, naturally,)…and there I thought I was the only one who didn’t know what they were until we saw them at the pet store! Of course, my daughter is desperate to get one but we have quite enough pets for one little house…cute or not!! 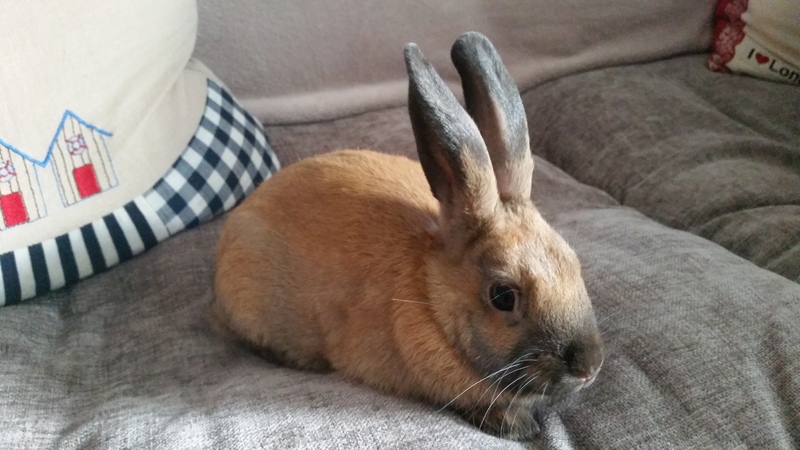 And yes, Bunnykins is a cutie, although we can’t let him out at the moment as he has destroyed a few wires so we are having to get him some kind of run…but he’s got a nice sized pen indoors and we take him out for cuddles and a run on the furniture…he’s litter trained so that’s good! 🙂 The book is bubbling away in that oven, but yesterday I faced a big freeze in trying to edit the first five chapters, something that’s been eating away at me (pardon the pun!) since I finished the first draft four weeks ago. It was a mess but I managed to get it down to the first chapter and that first line for which I’ve been searching. I think I can’t wait for you to read it…but I warn you, there are some things there are not pretty. But they have to be there. 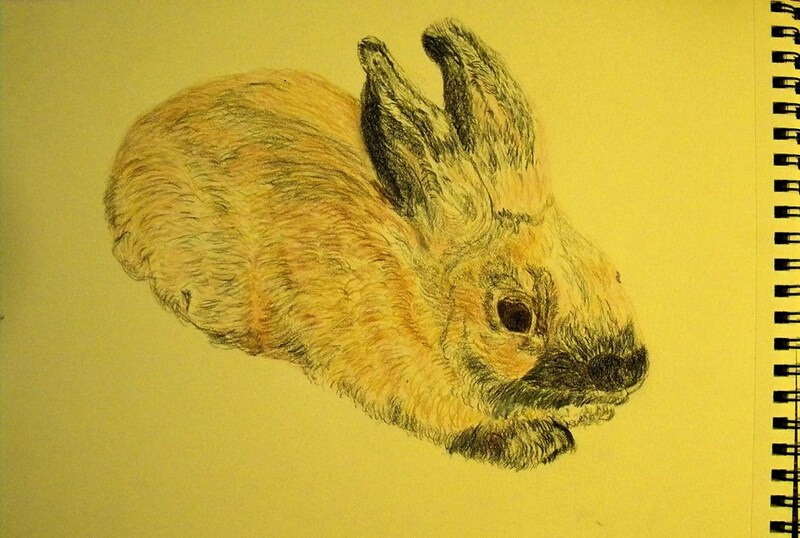 So…pressing on, I have to think of my post for Charli today…but no bunnies in danger this time. Something a little more sinister methinks… 😉 Thanks so much Norah! No matter how cute they are, pets always require special handling and accommodation, don’t they? I wonder how long you’ll be able to hold out on the request for one or two degus! Funny you say about Lewis and Tolkien again. I didn’t even know they were contemporaries, let alone friends. Wouldn’t it be great to have a timeline of authors’ lives with friendship connections shown. It would be an interesting thing to see and to perhaps compare similar and dissimilar influences. It will become more complex now, I think, with these online communities of writers and friendship groups. Thank you for introducing us to Nate Bunnykins, Sherri. He’s adorable and I’m sure is very thankful to you for saving him. I love the very first photo of him, especially with that seaside cushion just behind him. Only yesterday we were in a local pet store picking up some treats for Toby, and we saw a rabbit in a cage with a sign saying that he was up for adoption because he had been in the store for such a long time. I felt so sorry for him and would have adopted him but I don’t think a certain cardigan corgi would have been too happy about that! However, by the time we left, it was wonderful to see a family which included two young children announcing that they had come to give him a home. Phew, I wiped away the tears all the way home. I would have loved to have seen Ethel’s face when she saw Fred in that nightie. They make a great pair and I’m so glad you are keeping them here on your blog. I wonder what adventures await them both? My pleasure Hugh! You know how it is with our beloved pets as part of the family 🙂 Interesting you point out the seaside cushion…I saw it at an RNLI gift shop and my daughter got it for me as a present a couple of years ago, I love anything with a seaside theme. In fact, I keep meaning to get material to make seaside curtains for my summerhouse…three years and still ‘meaning’…! Oh what a delightful story about ‘your’ bunny…so happy to know he found a loving home. It is so sad isn’t it to see these pets that are left alone like that. We just couldn’t bare to leave Bunnykins behind. But yes, you are right, your little fellow wouldn’t be too happy with such a ‘friend’. We were worried about the cats but it turned out okay, but then again, cats…dogs…very different breeds aren’t they? As it is, Bunnykins lops after them and they run away after a while!! Nate Bunnykins, friend of cats, I bet that a bit heart stopping the first time, I’m glad you got the last and best bunny of the pack…litter. He is so cute. Life is strange but it is a journey and one that I hope will become wild in a fairly calm sort of way soon, a bit like your story that once again caught me off guard like a compliment about my hair which really doesn’t deserve it. I hate having my photo taken but I look better than usual, I was caught on a good day I think hehe. It’s very rare it happens that I appear photogenic so set your alarm for 2018 when the next one is scheduled lol. 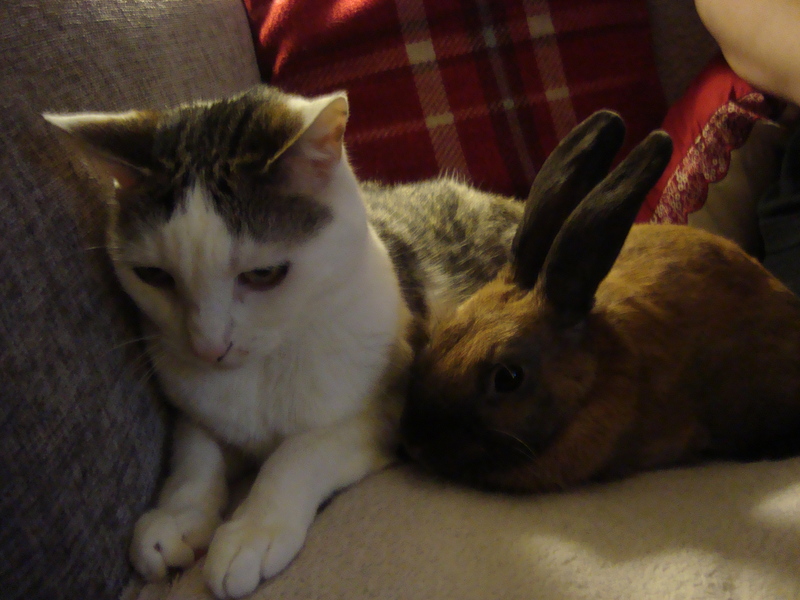 It is lovely to see Nate Bunnykins and Maisy getting on so well together. I think it is serendipitous for Nate as otherwise it would be a bit of cat and bunny then into tummy. How wonderful to hear those whisperings of Lewis and JRR Tolkien and even better to know you had achieved what you only wished for years before. I’d love to see the panther but like you I wouldn’t want to watch him eat a bunny. Yes ironic for Fred but perhaps if he’d known bunny wouldn’t have survived. 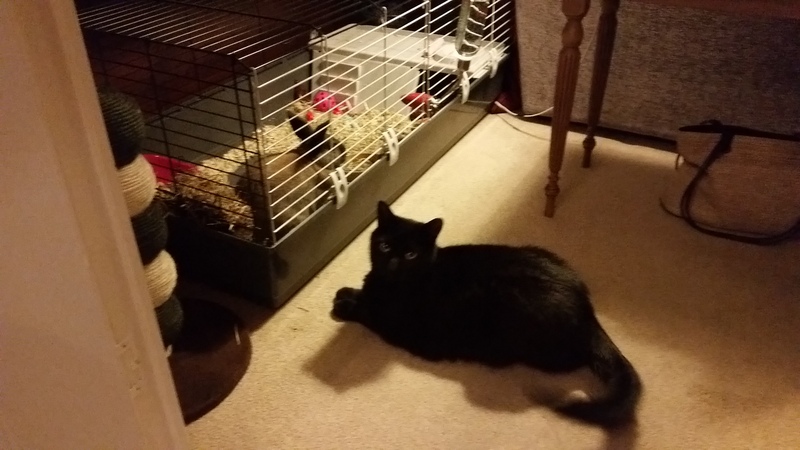 Your cat and your bunny are friends??? How wonderful to see them cuddling up together! Haha…I can only imagine…and won’t put it to the test!!! Partners in crime fits the bill a little too close for comfort I think…. ! Yes, so cute! I think he is the classic ‘Peter Rabbit’ and fell instantly in love with him 🙂 We let him out of his pen in the living room every evening (we moved him indoors out of his outdoor hutch when it started getting colder, since it is just him). But he chews wires and we have to block off so many areas where he can do damage. We’re having a rethink as to the best way around it…some kind of bunny run, but we are running out of room! I hope your friends resolve their bunny argument! Still catching up on blog visits and somehow I landed here – congrats on bunnykins – laughing at why he was grumpy at first (the neutering- lol) and oh my gosh – really laughing at the pet bread!!! Bah! well the trip to France sounds like it has lots of these little tidbits and stories….